Personal cultivation as described by the Cannabis Act (2017) will permit adults to cultivate up to four cannabis plants per household as of October 17, 2018. The Canadian Federal government will be responsible for regulating and enforcing industry-wide standards for commercial producers, while the provinces and territories will be responsible for overseeing the distribution and sale of cannabis, as well as developing guidelines and rules for growing cannabis at home. This fact sheet identifies health and safety concerns that may be relevant for personal cultivation and recommends key messages to help mitigate some of these risks. Evidence-informed public health involves integrating the best available research evidence into the decision-making process. Additional factors - community health issues and local context; community and political preferences and actions; and public health resources - create the environment in which that research evidence is interpreted and applied. 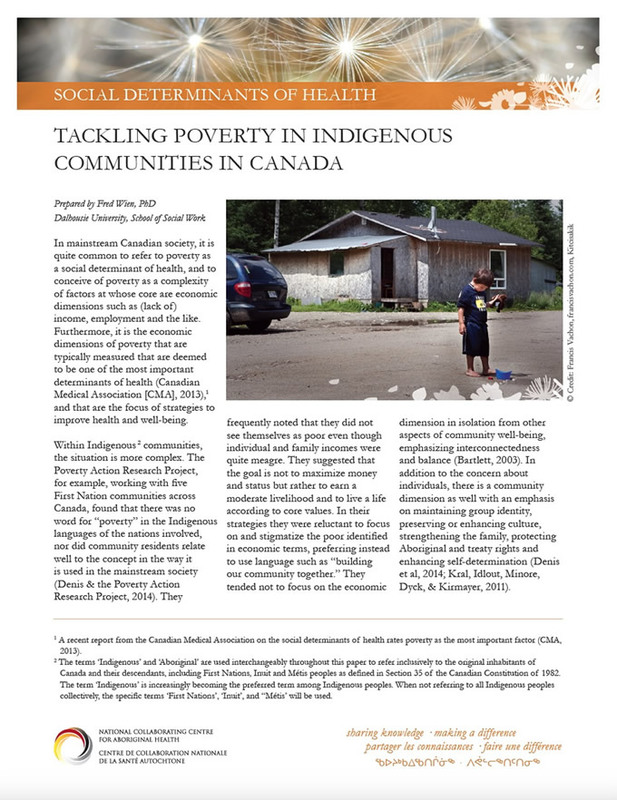 For First Nation, Inuit and Métis peoples in Canada, who experience a disproportionate burden of illness, poverty is both deep and widespread. This paper briefly examines the breadth and depth of poverty in Indigenous communities using standard economic indicators. The paper shows some of the ways in which poverty contributes to lack of community health and well-being. It concludes by identifying a number of different strategies for tackling poverty in its economic dimensions, including some that have worked well in Indigenous communities. 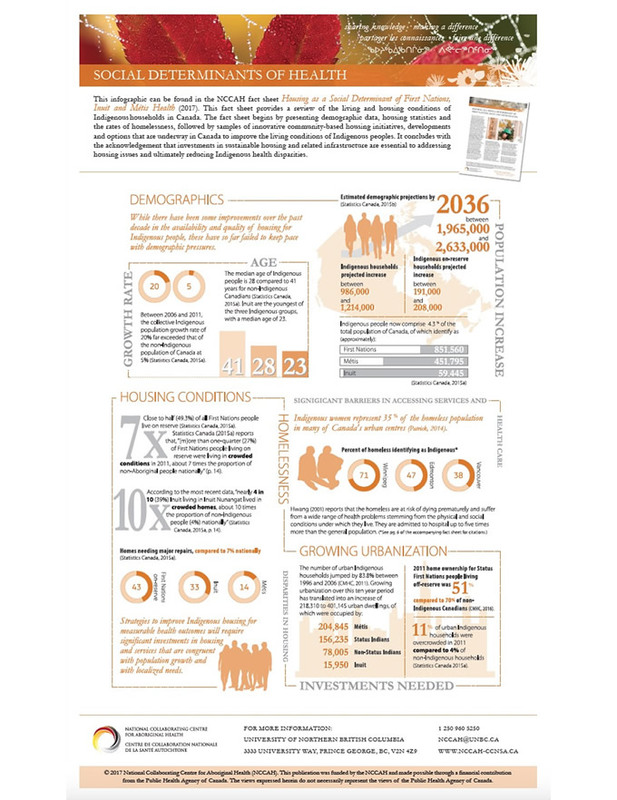 An infographic overview included in the "Housing as a Social Determinant of First Nations, Inuit and Métis Health" fact sheet. The intent of this briefing note is to introduce some tools developed in recent years to facilitate the integration of health issues into the decision-making processes of sectors whose primary concern is not population health. How do you know if a systematic review has been done well? First you need to know the parts that make up a systematic review; then you need to know where to focus your attention to assess the quality. This tool describes the anatomy of a systematic review so you can quickly and easily find the information you need to complete the critical appraisal process. Standard burden of disease measures identify differences in disease patterns and trends for a population, but do not always look for differences within the population. We need a different approach to thinking about and measuring burden of disease—one that considers the social determinants of health and the effects of inequity. Putting together relevant combinations of keywords to identify documents discussing complex subjects in databases is not easy. Within the context of carrying out a review of the literature on knowledge sharing targeting public policies, we developed a query to search databases through the OVID, EBSCO and ProQuest interfaces. In this document, we present the complete query so that interested readers may draw upon it for inspiration or reproduce it for their own work. The Notifiable Diseases Database is a public online resource for notifiable disease policy information in Canada. It provides a central location where federal, provincial and territorial notifiable disease lists, case definitions and legislated reporting requirements can be easily retrieved and compared. The Notifiable Diseases Database is particularly useful for Canadian public health officials, policy makers, epidemiologists, practitioners and researchers, among others. It provides context to the collection of provincial, territorial and national surveillance data, which can lead to better interpretation, communication and response in the face of outbreaks and epidemics. The NDDB is used to stimulate discussion regarding variations in notifiable disease lists, terminology, case definitions and reporting criteria across the country. Gaining a better understanding of how knowledge circulates in the political sphere can help improve knowledge-sharing practices so as to increase their desired outcomes. In order to deepen this understanding, a graphic representation (a logic model) of the processes through which public health knowledge can influence public policy is presented in this document.